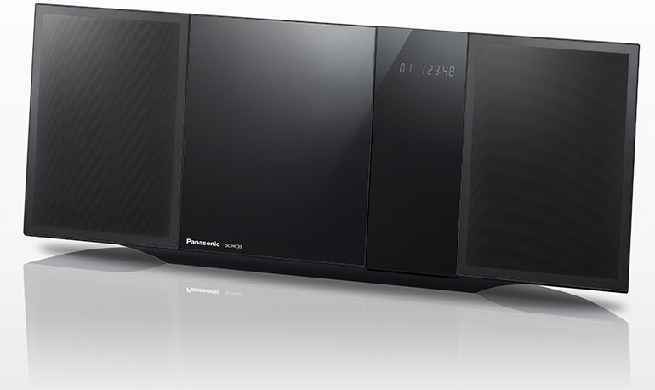 Panasonic has just announced their new SC-HC39 Compact Stereo System. The SC-HC39 caters to those who like to use their mobile devices/smartphones to listen to music with. With both networking and sound-enhancing technologies, the SC-HC39 is set to provide an enjoyable listening experience from a small, stylish compact speaker system. The new Panasonic SC-HC39 is equipped with Near Field Communication (NFC) that simplifies Bluetooth connections – making it as simple as waving a smartphone over the One-touch Connection mark on the SC-HC39 to complete the pairing. The Panasonic SC-HC39 improves on its predecessor by adding LincsD-Amp 2nd generation. The lastest technologies minimize jitter for improved sound. With the Bluetooth Re-master function, compensation for high-frequency loss in Bluetooth compression is achieved, providing crisper, clearer sound. A light yet rigid Nanosized Bamboo Cone Speaker and Dual Passive Radiator are used in the SC-HC39 speaker units to deliver dynamic bass and clear, transparent sound. With a simple design and flat/smooth surfaces, the new SC-HC39 should be easy to incorporate into decor. The new Panasonic SC-HC39 will be is available soon. Look for more details to be shared, including pricing, at: www.Panasonic.com.